Mykonos needs no introduction. 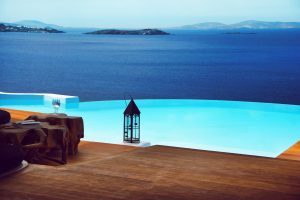 The legendary Greek Island is renowned for its stunning beaches, delectable luxury restaurants and chic nightlife. Every year, visitors from all over the world flock to the island to make the most of the sophisticated bars and restaurants, or to simply laze by the beach with a cocktail in-hand. Travelling to Mykonos soon? Here is our guide for where to eat, party and play on this stunning Greek Island. 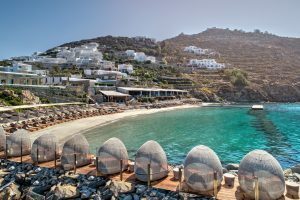 Just in time for an epic summer 2019, the world-renowned beach club Blue Marlon Ibiza has announced it is opening a venue on Mykonos. Blue Marlon Ibiza has been a favorite for the well-heeled crowd in Ibiza, and we have no doubt it will bring the same enviable line-up of DJs and events to our island. If you like your lunch with a view, you’ll be spoiled for choice in Mykonos. There are many hot spots to enjoy a relaxed yet stylish lunch, all while overlooking the dazzling sea. Savor the mouthwatering menu of Nammos all while your toes are in the sand and the dazzling ocean is just meters away. This stylish restaurant offers a delectable lunch menu with a focus on fresh ingredients and zesty flavours. Lying on a stunning sea-front deck, stylish Principote is effortlessly elegant; laidback yet luxurious. Enjoy the rich flavours of the Mediterranean-inspired menu, which is best accompanied by fine a drop from the extensive wine list. Enjoy an informal restaurant and charming Alemagou, with its bohemian and eclectic beachfront decor. Offering a menu that features classic Greek recipes with a modern twist, made from only the freshest ingredients, it’s a favorite for many. Following the success of its sister restaurant in Athens, Pasaji has brought its delectable menu to Mykonos. Enjoy dishes inspired by Greek, Chinese and Italian flavours, all while taking in the stunning sea views. Chic Scorpios is more than a beachside restaurant; it is a true experience. While the party arrives in the evening, by day it is a fabulously laidback and elegant hub, with stylish natural accents and a mouthwatering menu that’s inspired by the Mediterranean and vegetarian-friendly. It’s long been a staple on any stylish itinerary, and it shows no sign of slowing down. The beachside Buddha Bar offers a tantalizing menu that blends east and western flavours. Find out what all the fuss is about and enjoy a laid back lunch. Fancy sipping a tropical cocktail as the sun dips below the sea’s horizon, or maybe some evening shisha? There’s no shortage of stylish offerings. Here are our favorite sunset bars and shisha bars in Mykonos. As the sun goes down, Scorpios comes alive with chic beats that are the perfect backdrop for a dazzling sunset. Whether you choose to enjoy your cocktail or shisha (or both) on the sand or on the terrace, you’re in for a treat. 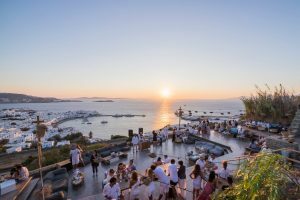 The gorgeous 180 Sunset Bar offers a unique and dazzling experience in Mykonos; the chance to watch the sun set from a historic and beautiful castle that overlooks the city and bay. It’s an atmospheric and charming place to indulge in some drinks or shisha. The elegant and contemporary setting of beautiful Cavo Tagoo is the ideal backdrop for a finely-crafted cocktail or evening of shisha. Stunning views over the dazzling Aegean Sea and a magnificent wine list top off the experience. 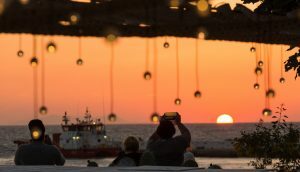 Enjoy a stylish evening watching the sun set surrounded by the stylish decor of Pasaji. 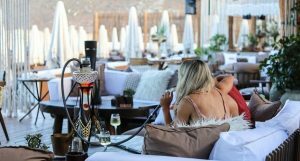 They bring the same enthusiasm for mouthwatering flavours and exceptional service to their cocktail list, making it a wonderful choice for an evening drink or shisha. The allure of Mykonos’ world-class restaurants draws many to the island. With these exceptional restaurants, you certainly won’t be disappointed. Join the well-heeled party crowd at Ling Ling from Hakkasan, in Mykonos’ old town. Enjoy a delicious menu featuring Cantonese dishes crafted from scrumptious Greek ingredients, and perhaps stay for the party. Take your taste buds on a journey around the world at stylish Casa Tu, nestled in the heart of Old Town in Mykonos. The tantalizing menu features flavours from the east and west, all prepared to perfection with fresh and delicious ingredients. Owner Kobu Matsuhisa is a true legend of sushi, and he brings his signature kokkoro (with heart and mind) approach to sunny Mykonos. Watch as Matsuhisha and other expert sushi masters prepare mouthwatering New Japanese dishes, with European and South American twists, for you to enjoy. Indulge in a scrumptious dinner in a lavish contemporary setting at the world-famous Cavo Tagoo. Savor classic Greek dishes and international flavours, each with a contemporary twist and made from the finest fresh, locally sourced ingredients. For over fifty years, Remezzo has been enticing guests with its dazzling views and exceptional menu of Greek fusion dishes. Join the party and enjoy mouthwatering seafood and vegetarian dishes, as the music plays and the view astonishes. As night falls, the Buddha Bar turns the volume up, with an enviable calendar of world-class DJs and cocktails from renowned mixologists. Then, there’s the mouthwatering menu that fuses eastern and western flavours to create delightful offerings. This ultra-chic restaurant has been a top choice for luxurious gastronomic experiences since it opened in 2002. Designed by a world-renowned interior designer and featuring a scrumptious international menu, it’s the place to go for a stylish dinner that will likely turn into dancing to the world-class DJs. For an effortlessly elegant and stylish dinner, look no further than Pasaji. Here, the emphasis is on mouthwatering cuisine, inspired by the Mediterranean and crafted from locally sourced ingredients. 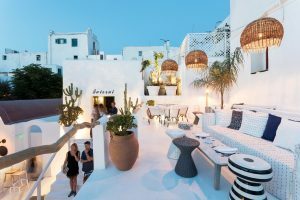 It wouldn’t be a luxurious stay on Mykonos without indulging in a scrumptious seafood feast — such as that at laidback and breezy Roca in Old Town. The simple and stylish setting allow for the mouthwatering flavours and dishes to speak for itself. The Lobster Spaghetti is particularly unmissable. Offering delectably fresh and flavorsome seafood inspired by traditional Greek cooking methods, stylish yet simple Sea Satin is the place to be if you like delicious dining accompanied by a buzzing party atmosphere. Eclectic Nikkei not only effortlessly fuses decor trends, but also its cuisine. With a tantalizing and innovative menu that fuses Japanese and Peruvian flavours, it is a truly unique offering that is sure to delight. Offering a cool and sleek setting with rich and warm hospitality, Koursaros has been delighting even the most discerning visitors for more than two decades. With a delicious Greek-inspired seafood menu, it is the perfect setting for a luxurious dinner in Mykonos. 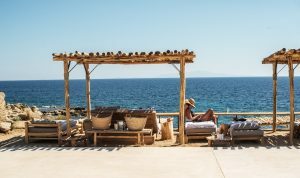 While relaxing by the beach under the delightful sun is always a classic choice, Mykonos offers so much more. Here are some of our favorite activities to enjoy on the island. If you can draw yourself away from the beauty of Mykonos, there are even more fascinating islands to be discovered. Sail away for a day exploring pristine islands and sleepy villages, discovering hidden beaches and warm traditional Greek hospitality. Struggling to choose between Mykonos and Santorini? 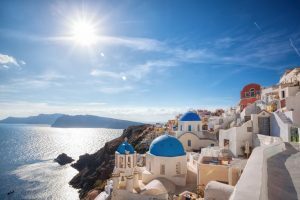 You don’t have to — Santorini is just a short distance away, meaning it’s simple to enjoy the delights of both islands on one incredible trip. Is there a more romantic or elegant way to discover the beauty of Mykonos than on horseback? Join a private or shared horse-riding tour, and you’ll be cantering through the waves in no time. The gentle waves of Mykonos are perfect to enjoy a kite-surfing adventure. Whether you’re a novice or a seasoned surfer, the island is an ideal backdrop to surf the waves while holding on to a colorful kite. 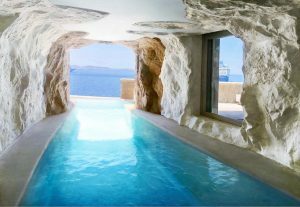 Discover the many gems of Mykonos hidden under the ocean. Dive shipwrecks, coral reefs and underwater caverns, being dazzled by the colorful coral and unique marine life. If you’re not already certified, Mykonos is the ideal place to learn. If you can dream it, you can do it when it comes to water sports on beautiful Mykonos. Enjoy everything from a relaxed morning Stand Up Paddle-boarding, to a heart-rate raising adventure zipping over the Aegean Sea on a jet-boat. Refresh your mind, body and spirit with expert-led yoga classes that are suitable for all ages and abilities. Many are taught on sea-front terraces, where you can feel the ocean breeze as you complete your practice. Learn how to recreate the tantalizing flavours and warm ethos of Greek cooking, in your very own home. Food is deeply entwined with culture, and this is a wonderful way to learn about the way of life on the Greek Islands. Shopping in Mykonos is a true adventure. From glamorous luxury boutiques lining well-paved sidewalks, to humble family-run stores tucked down cobblestone alleys, you could easily devote a day or more to exploring the many things on offer. There is certainly no shortage of options when it comes to enjoying a glamorous night out in Mykonos. While there’s no doubting the appeal of the beach clubs and bars, dancing the night away in an opulent private villa is pretty exceptional, too. As you can see, Mykonos is an enchanting island teeming with luxurious and exciting restaurants, bars and activities. We look forward to welcoming you to our little slice of paradise soon!